During my 36-hour trip to NYC this past week, I squeezed in catch-ups with long-time friends, an East Village shopping spree, a glorious run down the West Side Highway, meals at Bar Pitti, San Ambroeus, Bond Street, and Mercer Kitchen, speaking on a female entrepreneurial panel, and through it all, soaked up loads of fall style inspo. Which I thought I'd share with you! 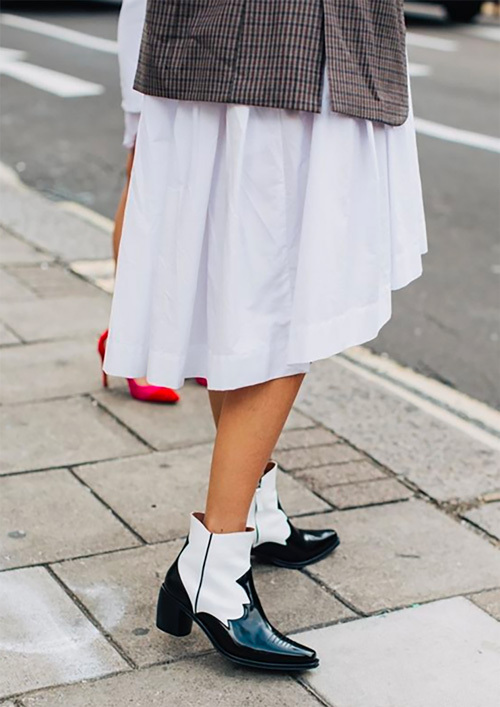 To start with, I saw more western boots on the streets of New York than I have in these western parts, including the eye-catchers, above, by Alexa Chung. I also like these more subtle/versatile takes from Splendid, Dolce Vita, and Tibi. Also desirable and ubiquitous: cozy, oversize sweaters, like this, this and this. Plus, animal prints and plaids were everywhere, including on me! I could use some more from Rachel Comey, Aquazzura, and Baum und Pferdgarten.